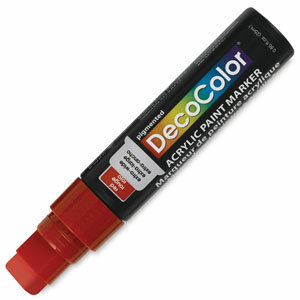 Decorate and paint your arts and craft projects with Decocolor Acrylic Jumbo Paint Markers. Great for use on wood, plaster statues, foam projects, walls, paper crafts, and terra cotta, they feature a 15 mm flat tip that paints thick or thin lines. Available in nine popular colors, including Silver and Gold, Decocolor Jumbo Paint Markers contain an opaque, waterbased acrylic paint that's acid-free, odorless, and permanent when dry. The paints clean up easily while wet. The markers should be shaken well before use, and capped tightly and stored horizontally when not in use. Note — Although these are acrylic paint markers, we do not recommend using in conjunction with actual acrylic paint.